Lettering, logos, and window film drive business exposure. Let our signage solutions point the way to new customers. Our Precision Installation Vinyl Lettering and Graphics Solutions combine high impact style with clarity and visual appeal for any commercial application. Design your office interior with a consistent visual solution, window film to promote an event or sale, or decorate your interior walls with brand theme graphics. You can count on Precision Installation to provide effective indoor signage and graphics displays. We provide indoor signage for projects including but not limited to lobby and reception area signs, directory signs, safety and compliance information, menu boards, wall, door and window artwork, block lettering, vinyl lettering, frosted privacy vinyl and full wall graphics. Whether labeling a fleet of trucks or a single vehicle, your business vehicle lettering is by far one of the most cost effective ways to advertise your business. A single investment in vehicle lettering allows you to advertise your business every time you drive. Statistics show a typical company vehicle on the road making daily deliveries and service calls will result in over 16 million visual impressions on a yearly basis. Let our trained professionals install your vinyl lettering quickly and efficiently! There is usually no permitting required since it is on a vehicle. However, we recommend you verify laws with your local permitting office. Transform your empty office or retail doors and windows into an attractive advertising space that enhances your brand, products and services with custom window decals and graphics from Precision Installation.Custom window decals can be applied to any interior or exterior glass surface. Decals are produced with graphic front and an adhesive back. They are easy to apply and remove. We offer a variety of vibrant colors with our state-of-the-art printing technology. Perfect for special promos or store sale! Increase exposure to your business to potential customers with news of promotions, sales, store hours, new inventory, or your company logo. Custom window decals are a crucial driving force for attracting new customers in to retail or store front business. From start to finish Precision Installation can customize your window graphic and have it ready for pick up in a snap. Window film blocks as much as 80% of the sun’s heat, and dramatically lower air conditioning costs. In colder months, window film will retain interior heat, and reduce heating costs. The return on investment truly is impressive. Window film increases office privacy, in ‘fish bowl’ office environments and gives an added element of style to your office space. 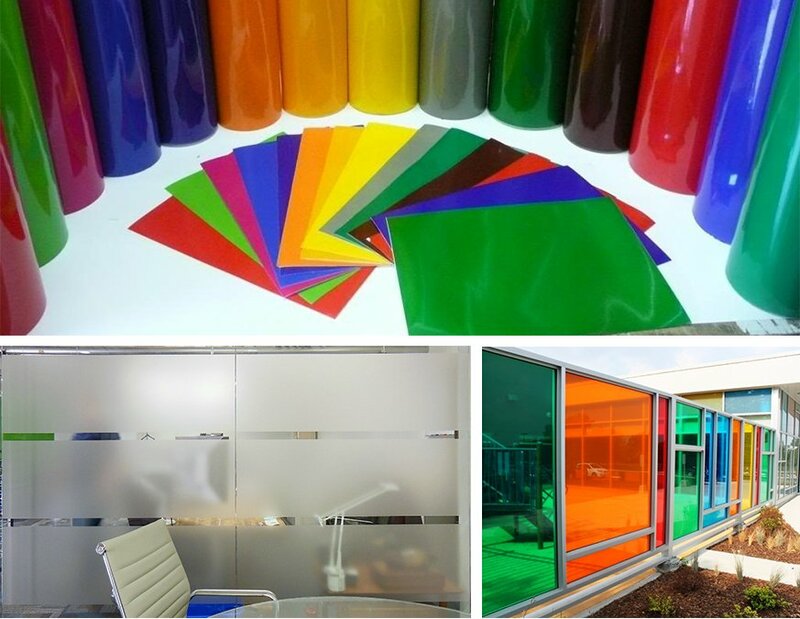 We can install both clear films in a variety of colors and textured frosted films to windows offering a variety of unique applications.